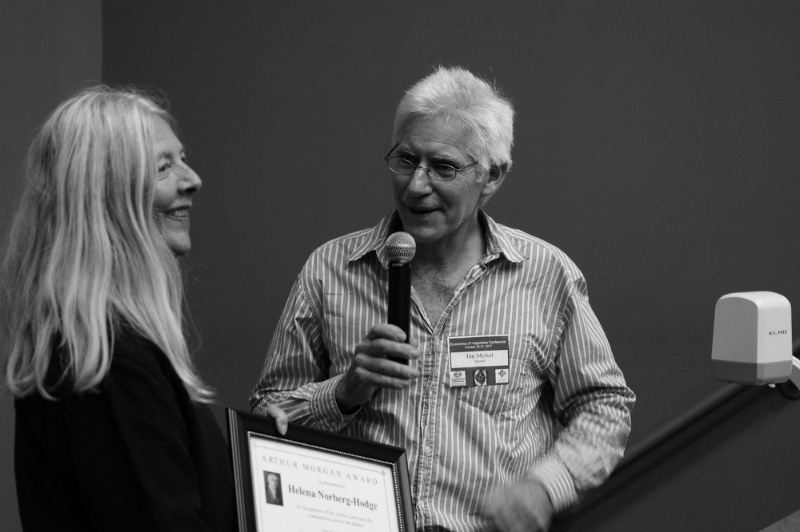 On September 27th, 2015, at the conclusion of our annual conference, Tools for Transition, Community Solutions presented the Arthur Morgan Award to Stephanie Mills. Stephanie Mills is an acclaimed author, bioregionalist, speaker and activist. Stephanie Mills grew up in Arizona and learned a love and respect for nature from her mother in their backyard garden. She began writing early, circulating one page satirical papers in the back of the third grade classroom. As a teen she wrote critiques of her high school, continued to put out humorous and satirical pieces, and began writing about social justice issues. She was heavily influenced by Mad Magazine. She went on to attend Mills College in Oakland, where she became involved with the literary magazine, the paper and an anonymous column talking about campus affairs. “[The speech] got coverage on its own merits and also because of the moment,” she says. “Over the years, one of the things that I said is that I would not have any children in light of the population explosion, and I haven’t. It seems to me that this is something that people in the developed world need to consider and act on. There were roughly half as many people alive then as there are now. I don’t think a single thing has been improved by the growth of human population. Not to regret the lives of individuals extant, but just the species phenomenon is really catastrophic. “Of course, how we live is critical and inequality within our species is egregious and the history of wrongs that capitalism, colonialism and empires have committed is great. Human population growth seems capable of trumping just about everything we try in the way of mitigating our impact. Not that we shouldn’t try every way we can to mitigate our impact, but the proliferation of human beings, rich and poor, presses against the earth’s capacity to sustain other forms of life. It’s an enormously complex system and over the years if I have learned anything, it’s that it’s foolish to try to say this is the issue to address to the exclusion of others or the understanding that everything is influencing by everything else at all times. Nevertheless if you’re called on to act you have to resort to some generalizations and set meaningful priorities. In 1984, as a result of a bioregional romance, Mills moved to Northwest Lower Michigan and was able to begin writing books. “I wanted both to serve the cause and create works of literary merit,” she says. “Two books--Whatever Happened to Ecology? and Epicurean Simplicity--were memoirs. In Service of the Wild, concerning ecological restoration and environmental history was my favorite project. It allowed me to learn about changes in the landscape and to walking alongside wonderful naturalists who were working to restore damaged lands. These were men and women trying to thwart the extinction crisis acre by acre, stream by stream, plot by plot. In 1996 Stephanie was named by Utne Reader as one of the world’s leading visionaries. She has a long time association with Community Solutions as a regular conference speaker and supporter, and wrote about Arthur Morgan in her biography about Bob Swann. She is the second Arthur Morgan Award recipient. The Arthur Morgan Award is designed to recognize individuals who possess the traits that Morgan wrote about: character, vision, entrepreneurship, and love of community. She received the award because of the breadth of her interests, and because she is living her life in consonance with her beliefs.